After staying indoors the whole day, in the afternoon, around 4.15pm, I decided to pack my sport wear and go to gym. According to the weather forecast, sun set would be at around 4.06pm, so I thought I would be walking in the ‘dark’. However, when I stepped out, day light was not totally gone yet, then after passing the buildings in the yards, which blocked my view, suddenly I saw the beautiful sky, rose, purple, orange, red— the sun was making its last splash in the sky, it was a beautiful picture in the west. I wished I had a camera with me. I could not help but looking back every single step as I moved forward. When I turned into another street at the end of the road, suddenly I realized there were so many people already coming out from the shops, galleries, restaurants, and were all looking at the sky. — It is not because something so rare, but because something we try not to miss in life. 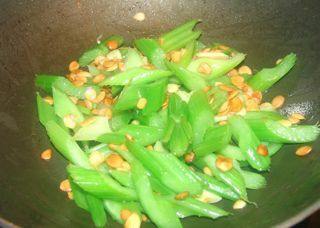 This recipe is an easy and healthy one — stir fried celery and almond. Ok, we have to talk about almonds a little bit. There is a difference between almonds grown in Southern China and those grown in Northern China; so, we usually distinguish between Northern and Southern almonds. 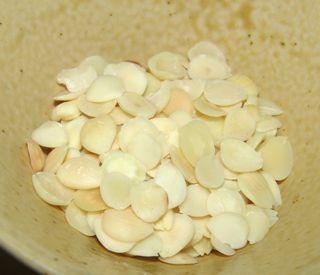 Southern almonds are ‘sweet–ish’, which is good for snacking, or to be used in cakes; Northern almonds are ‘bitter-ish’, and they are mostly used for ‘medical’ or ‘healthy’ purposes. As for their medical applications, Northern almonds are good for strenghening the lungs. The Ben Cao Gang Mu reports that Northern almonds contain essential nutrients for the lungs, and help smoothing any ‘air’ stuck in the body. In China, there are many recipes and different forms of almonds, of which the most popular one is the almond milk. Ok, coming back to this recipe. First thing I need to say is that only the very core part of the almonds are used in this recipe. Almond cores are white, almost ‘transparent’, a bit thin if it is halved into half, smells and tastes much stronger than just the nut itself. You can sometimes find it in Oriental supermarkets, but if you cannot find it, normal almond nuts are good too as substitute, but remove the ‘brown-ish’ skin. 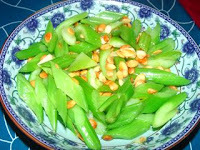 The recipe – stir fried almond and celery is good for ‘being thirsty’, ‘helping with anticipation’, and lowering down the blood pressure. There are two ways of using these two ingredients, one is salad, which is very good for warm spring or hot summer; another one is this one – stir-fried version, which is really easy and quick to cook. 2) Prepare around 1/2 cup of almond. 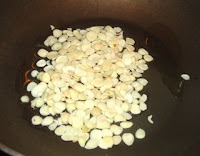 3) Chop around 3 gloves of garlic. 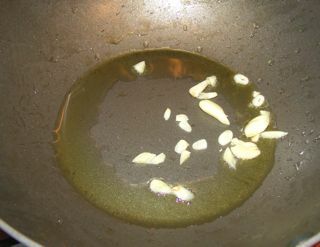 1) In a heated wok, (low fire) pour in around 3 tablespoons of oil. 2) Add in chopped garlic, ‘stir-fry’ until you can smell the garlic’s flavor. 3) Add in the almond, and stir fry quickly, don’t get it burned. 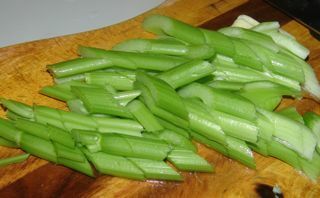 4) Then add in chopped celery, stir fry them together. 5) Add in a few drops of cooking wine, a bit more than 1/2 teaspoon of salt. —- Done!! How easy, and healthy, no? However, although almond is very good for the body, having too many is not recommended, for they can generate toxins in large amounts.